The 4Knots Music Festival will feature renowned and emerging artists from today’s music scene performing live all day in front of what is sure to be yet again an extremely large and enthusiastic audience. A full lineup of the day’s events will be announced in coming weeks. Last year’s event featured music from: The Black Angels, Titus Andronicus, Davila 666, Oberhofer, Eleanor Friedberger and numerous others. Running between every borough of New York City and culminating near the South Street Seaport, the East River runs at a speed of 4 knots. The Seaport and Pier 17 have a rich and diverse history as profound to New York City as Wall Street, Central Park or even Times Square. Historically, the lower portion of the East River has been one of the busiest and most important channels in the world. For more info and (eventual) band updates keep up with: www.twitter.com/4knotsfest, www.villagevoice.com/4knots. 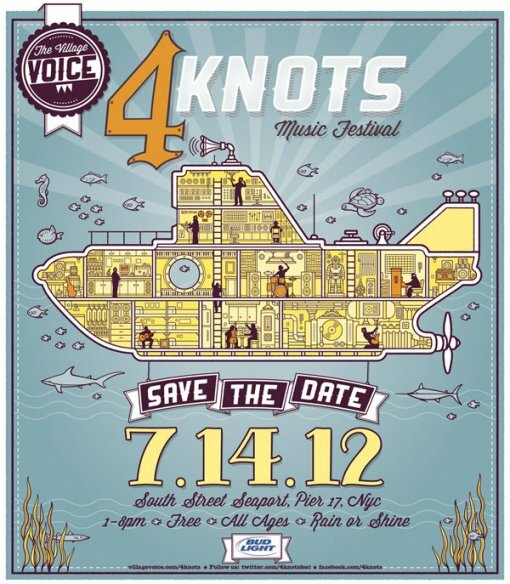 Save the date flyer for this year’s 4Knots after the jump.